Dentigerous cyst (DC) is a developmental jaw cyst associated with a crown of unerupted/impacted tooth. DC is usually seen as a unilocular, well-defined radiolucent area clinging to the tooth in the cemento-enamel junction. The borders may be scalloped and positioned centrally or laterally on dental crowns. , DC has a tendency to teeth displacement and resorption. DC may resemble odontogenic keratocyst (OKC), unicystic ameloblastoma (UA), and ameloblastic fibroma on plain radiography. ,, Computed tomography (CT) provide important information for the differential diagnosis. In this study, clinical and radiological features of 18 cases of DC from 18 patients were investigated and compared with the similar studies in the literature. Eighteen DC cases of 18 patients who applied to our clinic between the years 2010 and 2012 and who had histopathological diagnosis were examined retrospectively. The patients' clinical information, plain graphies, CT examinations, operation notes and histopathological assessment results were recorded on a table [Table 1] and [Table 2]. Follicular space and the sizes of the cysts were measured in the panoramic radiograph. For follicular space, the distance from a dental crown to the cyst wall was measured, and for cyst size, the measurement was made at where the cyst was the widest. Nine of 18 patients had both panoramic graphy and CT examinations. In CT, the cyst size was measured at where the cyst was the widest on the axial scan [Figure 1] and [Figure 2]. The ages of 18 patients who were found to have DC were between 13 and 61, and the average of their ages was 32 (±15). Nine patients (50%) were female, and 9 (50%) were male. Male/female ratio was 1:1. Of the 18 cysts, 12 (67%) were in the mandible and 6 (33%) were in the maxilla. 11 (61%) DCs were detected incidentally during routine examination. In the symptomatic cases (n = 7), 5 (71%) had swelling, 4 (57%) had pain and 2 (29%) had pus drainage [Figure 3]. Eighty three percentage of DCs were smooth whereas 17% had scalloped borders on panoramic radiography. Cyst was centrally and laterally positioned in 10 (56%) and 8 (44%) of the cases respectively. Jaw expansion was observed in 4 (22%) of the cases. Resorption in ivolved/adjacent tooth in 4 (22%) patients and displacement of involved/adjacent tooth in 67% of the cases were observed [Table 1]. Loss of lamina dura was observed in 9 (50%) of the cases. In the panoramic radiography, minimum follicular space was found to be 3 mm (case 16), maximum follicular space was found to be 24.6 mm (case 18) and average follicular space was found to be 11.5 (± 7) mm, while minimum cyst size was found to be 9.3 mm (case 11), maximum cyst size was found to be 54.3 mm (case 18) and average cyst size was found to be 23.5 (± 1) mm [Table 2]. Of the DCs cases in the maxilla, 3 (50%) were anterior, and 3 (50%) were in the posterior area. Of the DC cysts, cases in the mandible 4 (33%) were anterior, and 8 (67%) were in the posterior are [Table 2]. The rate of anterior/posterior in the maxilla was found to be 1/1, whereas the rate of anterior/posterior in the mandibular was found to be 2/3. 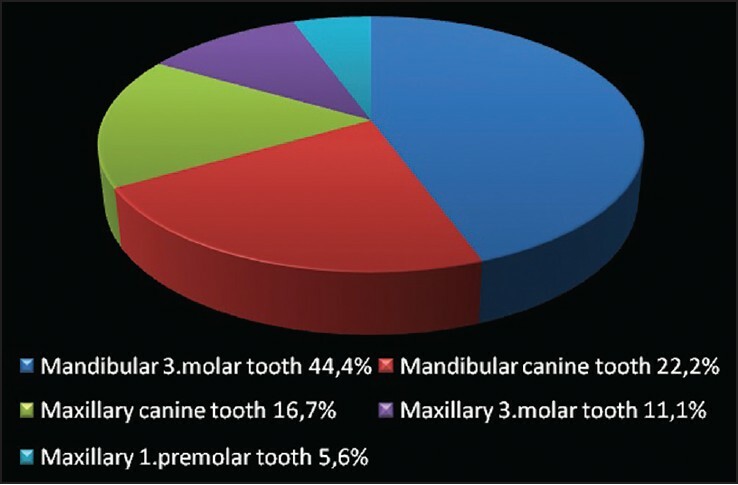 Eight (44%) of 18 DCs were associated with mandibular third molar tooth, this was followed by mandibular canine 4 (22.2%), maxillary canine 3 (16.7%), maxillary third molar 2 (11.1%) and maxillary first premolar tooth 1 (5.6%) [Figure 4]. When the relation between 18 DCs and anatomical structures examined, displacement of the mandibular canal was observed in 5 (42%) of 12 mandible DC cases and displacement of maxillary sinus occurred on 2 (33%) of 6 maxillar DC cases [Table 2]. Of the 9 cases who had panoramic radiography and CT examinations, 6 (67%) had smooth borders, and 3 (33%) had scalloped borders. 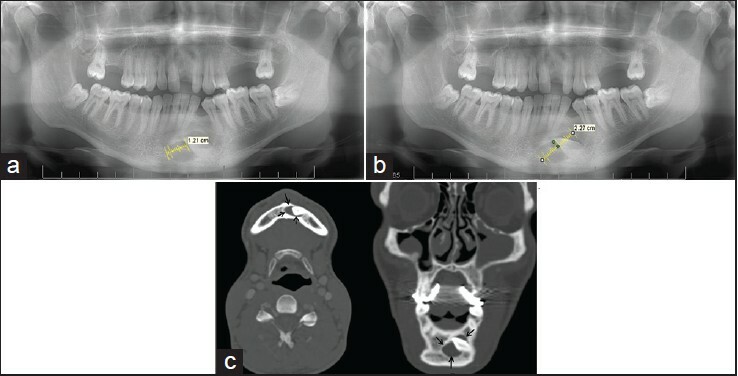 Panoramic radiography showed expansion in 2 (22%) of the 9 DC cases, while CT showed expansion at the jaw in 8 (89%). Of the 8 cases who were found to have expansion, 4 (50%) had buccal expansion, 3 (37.5%) had buccal-lingual expansion, and 1 (12.5%) had palatal expansion. Dentigerous cysts are mostly asymptomatic, and they are seen by chance in radiographs that are taken for other reasons. ,,, 61% of the cases in our study were asymptomatic. Tsukamoto et al. have reported that 58% of the DCs they examined were symptomatic while 42% were asymptomatic. Sanatkhani et al. reported that 15% of the DCs they examined had pain while 80% had swelling. Dentigerous cysts are mostly seen in panoramic radiographies as unilocular, well-defined radiolucent areas that show cortication. ,, If they are infected, they may be ill defined. Often their borders are smooth; however, they may be scalloped in big cysts. ,,,, Motamedi and Talesh  reported that 92.5% of the cysts they examined were unilocular and smooth borders while 7.5% were scalloped borders. Tsukamoto et al. examined DC cases with panoramic radiography, and they reported that 84% of the cases had smooth borders, while 16% had scalloped borders, and they found that the ratio of smooth/scalloped was 5.4:1. In our study, 83% of the DC cases in panoramic radiography had smooth borders, while 17% had scalloped borders, and the ratio of smooth/scalloped was found to be 4.8:1. Dentigerous cysts were reported to be mostly in the form of central variety. , In our study, 56% of DCs were centrally located while 44% were laterally located. Dentigerous cysts are found to occur in the mandible more frequently than the maxilla (75%). Lin et al. reported that 63.9% of DCs were in the mandible and 36.1% were in the maxilla; Mourshed  reported that 73.9% were in the mandible and 26.1% were in the maxilla, Zhang et al. reported that 82% were in the mandible and 18% were in the maxilla; Motamedi and Talesh  reported that 57.5% were in the mandible and 42.5% were in the maxilla and Avelar et al. reported that 59% were in the mandible. In our study, the ratio of mandible/maxilla was found to be 2/1. Dentigerous cysts are mostly associated with mandibular third molar tooth. ,, Lin et al. reported the rate of third molar tooth being associated with DC as 45.3%, Zhang et al. as 77% and Jones et al. as 73.2%. In our study, this rate was found to be 44.4%. DCs is secondarily reported to be associated with maxillary canine tooth. ,,, Regezi and Sciubba  stated that the most frequently seen impacted teeth were the third molar and maxillary canine teeth, and thus DCs occurred most frequently in these teeth. Lin et al. reported that supernumerary teeth were the ones that DCs occurred second most frequently while Zhang et al. reported that maxillary third molar teeth were the ones that DCs occurred second most frequently. In our study, mandibular canine teeth (22.2%) were the teeth that DCs were second most frequently associated with [Figure 4]. Dentigerous cysts can cause displacement and root resorption in the involved/adjacent teeth. ,,, In our study, displacement was seen in 67% of the involved/adjacent teeth. The rate of root resorption was found to be 40% by Sanatkhani et al.,  55% by Struthers and Shear  and 17% by our study. Dentigerous cysts can also cause buccal and lingual expansion in the jaw. ,,, Hydraulic expansion and cortication can be seen well in CT and cone beam CT (CBCT). They rarely reach very big sizes. In our study, CTs showed jaw expansion in 8 (89%) of 9 DCs. Panoramic radiography showed expansion in 2 (22%) of these 9 DCs. In contrast enhanced CT (CECT), soft tissue window, contrast enhancement is seen in the cyst wall. If the cyst is not infected, there is no enhancement within the lesion to suggest a solid neoplasm. In our study, cyst wall contrast was seen in 5 of the 9 cases. Dentigerous cysts can cause displacement in the maxillary sinus, mandibular canal and nasal fossa. ,,, In panoramic radiography, displacement was seen in neighboring anatomical structures of the 7 (38.9%) out of 18 DCs. This study showed that DCs occurred most frequently in the posterior region of the mandible and related to third molar tooth. The cysts had a tendency to displace associated and/or adjacent teeth. Panoramic radiography is important in finding out these cysts. CT is recommended for differential diagnosis, expansion and association with neighboring anatomical structures. This study was presented as a poster presentation in 19 th International Congress of Dento-Maxillo-Facial Radiology. June 22-27 2013, Bergen, Norway. White SC, Pharoah MJ. Cysts and cystlike lesions of the jaws. In: White SC, Pharoah MJ, editors. Oral Radiology: Principles and Interpretation. 6 th ed. China: Mosby; 2009. p. 346-50. Langlais RP, Langland OE, Nortje CJ. Diagnostic imaging of the jaws. Malvern (PA): Williams & Wilkins; 1995. p. 286-93, 327-35. Shafer WG, Hine MK, Levy BM. A Textbook of Oral Pathology. 4 th ed. Philadelphia: WB Saunders; 1983. p. 260-5. Regezi JA, Sciubba J. Oral Pathology: Clinical-Pathologic Correlations. 2 nd ed. Philadelphia: WB Saunders; 1993. p. 326-32. Neville BW, Damm DD, Allen DD, Bouquot JE. Odontogenic cysts and tumors. In: Neville BW, Damm DD, Allen DD, Bouquot JE, editors. Oral and Maxillofacial Pathology. 3 rd ed. St. Louis: Saunders Elsevier; 2009. p. 678-740. Avelar RL, Antunes AA, Carvalho RW, Bezerra PG, Oliveira Neto PJ, Andrade ES. Odontogenic cysts: A clinicopathological study of 507 cases. J Oral Sci 2009;51:581-6. Zhang LL, Yang R, Zhang L, Li W, MacDonald-Jankowski D, Poh CF. Dentigerous cyst: A retrospective clinicopathological analysis of 2082 dentigerous cysts in British Columbia, Canada. Int J Oral Maxillofac Surg 2010;39:878-82. Yeo JF, Rosnah BZ, Ti LS, Zhao YY, Ngeow WC. Clinicopathological study of dentigerous cysts in Singapore and Malaysia. Malays J Pathol 2007;29:41-7. Lin HP, Wang YP, Chen HM, Cheng SJ, Sun A, Chiang CP. A clinicopathological study of 338 dentigerous cysts. J Oral Pathol Med 2013;42:462-7. Tsukamoto G, Sasaki A, Akiyama T, Ishikawa T, Kishimoto K, Nishiyama A, et al. A radiologic analysis of dentigerous cysts and odontogenic keratocysts associated with a mandibular third molar. Oral Surg Oral Med Oral Pathol Oral Radiol Endod 2001;91:743-7. Koenig LJ, editor. Diagnostic Imaging Oral and Maxillofacial. Vol. 2. Canada: Amirsys; 2012. p. 106-9. Sanatkhani M, Zarch HH, Pakfetrat A, Falaki F. Odontogenic cysts: A clinical and radiographic study of 58 cases. Aust J Basic Appl Sci 2011;5:329-33. Bharatha A, Pharoah MJ, Lee L, Tay KY, Keller A, Yu E. Pictorial essay: Cysts and cyst-like lesions of the jaws. Can Assoc Radiol J 2010;61:133-43. Mourshed F. A roentgenographic study of dentigerous cysts 3. Analysis of 180 cases. Oral Surg Oral Med Oral Pathol 1964;18:466-73. Shear M, Speight PM. Cysts of the Oral and Maxillofacial Regions. 4 th ed. Australia: Blackwell; 2007. p. 59-76. Struthers P, Shear M. Root resorption by ameloblastomas and cysts of the jaws. Int J Oral Surg 1976;5:128-32. Barakat NJ, Nassar VH. Dentigerous cyst invading the sinus and floor of the nose: Report of case. Rev Dent Liban 1971;21:47-52. Scholl RJ, Kellett HM, Neumann DP, Lurie AG. 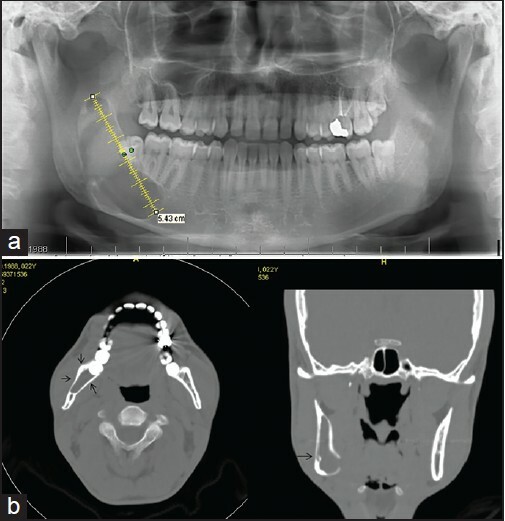 Cysts and cystic lesions of the mandible: Clinical and radiologic-histopathologic review. Radiographics 1999;19:1107-24.